While the Aurora Borealis was the highlight of my trip to Iceland, Iceland’s storybook geography and natural wonder were really worth the trip. I saw glaciers, ice-capped volcanoes, lava fields, black sand beach, geysers, hot springs, and waterfalls. It was like middle earth. Another plus of Iceland for me was the ease of visiting. Many visitors come to Iceland and rent a car and drive around the one highway (Route 1) that runs around throughout the island. But I opted for an all-inclusive package tour because I wanted an expert guide who could show me the best area to see the Aurora. We started with a drive to Hella on a very clear day, we passed flat landscape with lava rocks sticking out. After hours, the lava rocks ended and started to grow green moss. The following morning, the weather had turned cold and gray as we traveled along the South Coast of Iceland to Vik village. 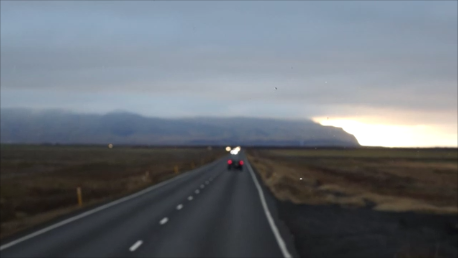 Clouds hang over the horizon, but the drive was gorgeous as streaks of sunlight tried to break through the clouds, highlighting the ice-capped mountain of Hekla. On both sides of the road, I saw a huge expanse of land with no trees. Sheep were grazing on green farmland with sporadic colorful red houses in the middle of what looked like middle earth. We first stopped at Seljalandsfoss Waterfall. Our guide told us that if we’re willing to get wet, we could walk behind the waterfall and take pictures from a different perspective. But I did not want to get wet on a very cold early morning so I did not go to the trail behind the waterfall. Instead, I walked the trail leading up to a smaller waterfall but did not go that far to see a couple more waterfalls streaming from the hillside walls. The gray sky had cleared as we passed a gorgeous mountain valley with an ice-capped mountain above and a towering mountain by the roadside. Upon hearing our collective wows, our driver stopped the bus to allow us to take pictures. Later that day, we returned to the area and stopped at the visitor center to watch a short film recounting the experience of the owners of a farm in the valley below the ice cap volcano, who lived through the Eyjafjallajokull eruption in 2010. We found the Skogafoss Waterfall just a few minutes away from the Eyjafjallajokull. Tucked between a protruding hill on the right side and the ever-present rainbow on the left, the Skogafoss Waterfall looked very dramatic. There was a trail that followed the protruding hill to the top. The climb was steep, but the reward was the spectacular view of Southern Iceland coastline. Our next stop was the Skogar Folk Museum. The main building contained artifacts like an old fishing boat to show us how Icelanders creatively adapted to their challenging environment. The open-air museum also included some buildings like turf houses, a church, and a schoolhouse. Approaching Vik, the road climbed a little higher and the wind started to pick up. I was surprised how our driver was able to handle the pummeling wind. When we reached the Southern tip of Iceland, the wind died down. The whole area was lovely. We had a very good lunch at Icelandair Hotel. After lunch, our driver dropped us off at an ice-wear store and factory. But I was not into shopping, so I walked to the black sand beach and took some pictures. We then explored the most famous Reynisfjara beach. We wandered out onto the wind-battered coast. Our guide warned us not to turn our back to the ocean and to not walk facing the mountainside. The view was incredible: the black sand beach, the beautiful column-pyramid rock formations, the waves hitting the basalt sea stacks (Reynisdrangar). Everything was photographable that it was easy to throw caution to the wind.